Greetings all. I wanted to share my success (and prior failures) with glycol cooling of my tap lines. First, a little background: My keezer is in the basement, and taps are on the first floor, almost directly above the keezer. The total run of insulated trunk line is about 10 feet. I've got five 5/16" product lines (two currently used) and two glycol 1/2" lines (supply and return). Everything in the trunk line is wrapped together with packaging tape. The insulation is 1/2" thick pipe insulation from McMaster. The tap box is insulated with 1/2" pink foam insulation. To cool the tap box I've simply got a loop of the 1/2" glycol line running around inside the box. 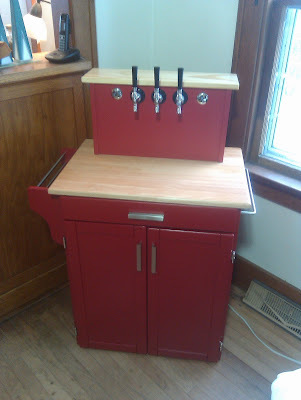 I've already got plans to rebuild the tap box (just not happy with version 1), and when I do, I'm going to borrow some design ideas from Micro Matic's Kool-Rite design. (Google their site if you need more info on that). 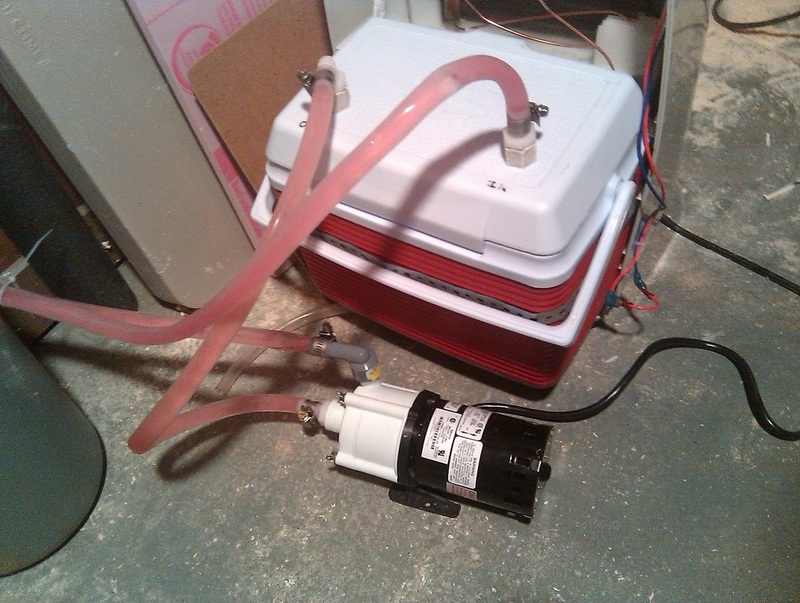 The first iteration of my glycol cooling was a tank in the keezer. That didn't work for crap! The temperature of the glycol would just slowly climb to only a degree or two below ambient. I tried a one gallon glass jug, and a five gallon plastic pail. Neither worked and frankly, I didn't really want to sacrifice space in the keezer anyway. 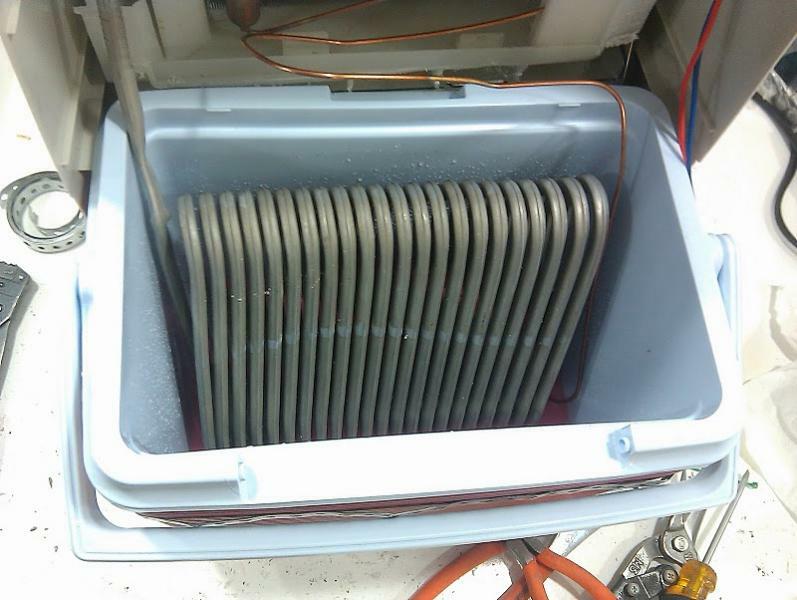 The second attempt was to use a air-to-glycol heat exchanger inside the keezer with air from the keezer being forced through it. I was using a repurposed motorcycle oil cooler with three 80mm computer fans, each rated for about 85 cfm each. This solution worked better, but it still couldn't chill the lines and tap tower to within a few degrees of the keezer. Also, the kreezer was working quite hard to keep up. It would only shut off for a few minutes each hour. Clearly, I was getting heat exchanged, but chest freezers aren't designed to work with that many added BTU's I guess. I'm sure it would be more suited for a shorter beer line run. The third, and final iteration was to replicate a commercial glycol power pack. I thought about converting a window A/C unit like others did, and I even have an extra one laying around, but based on my heat gain calculations for my line, it would have been way overkill. The math says I only need about 250 BTU/hr with 70 degree ambient and 35 degree beer (42 degree target glass temperature ). Had this design failed, I have a Micro Matic power pack in my eBay watch list right now! Fortunately for the budget, it works perfectly! I had a small dehumidifier sitting around that was just too small for my basement, so I figured there was no loss in going Dr Frankenstein on it. I hate to say it, but it really was a piece of cake. The condenser coils (cold) were aluminum, so bending them into place was very easy. A little to easy in fact, as they wanted to kink so I had to be very mindful of where I bent them. It freaked me out a little, so I was wearing a face shield and heavy welding gloves just in case the R134a got "liberated"! 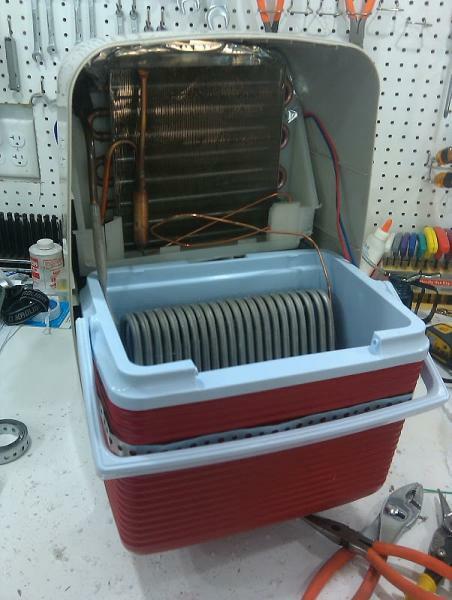 I bent the coils down into a 10 quart cooler, which holds two gallons of glycol solution. 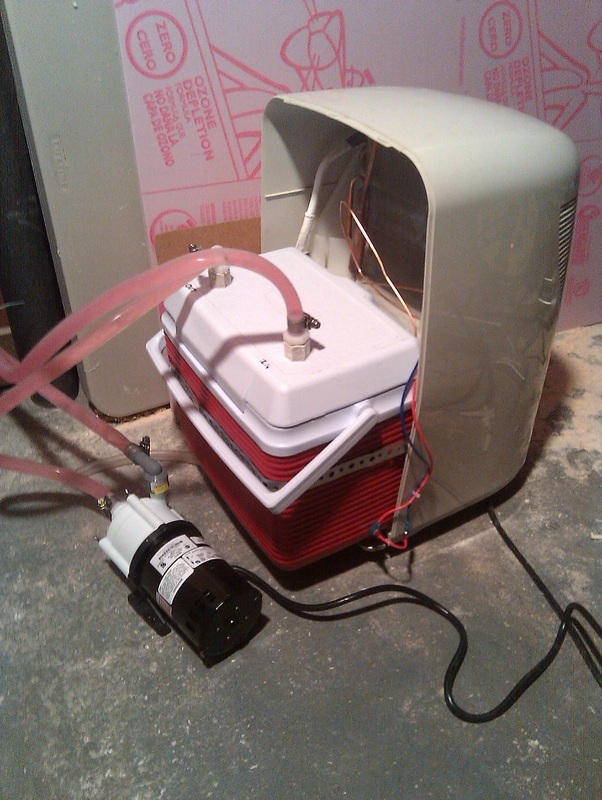 The initial test was to hot wire the dehumidifier controls and turn it on with a tiny fountain pump in the cooler circulating the glycol. In 20 minutes it had dropped the temperature of the solution to 18 degrees. At 30 minutes, the solution began to slush at 9 degrees. There was also no lid on the cooler at the time, so I don't know how much heat gain I got from just ambient air. Regardless, a casual calculation based on temperature change put the unit at around 1200 BTU/hr, meaning I should be able to run at about a 20% duty cycle to chill my lines. Having had success with the initial test, I cut the lid as necessary, installed plumbing and hooked it up to the pump (Little Giant 2-MD). After only 10 minutes of running, my glycol line temp in the tap tower was 27 degrees. 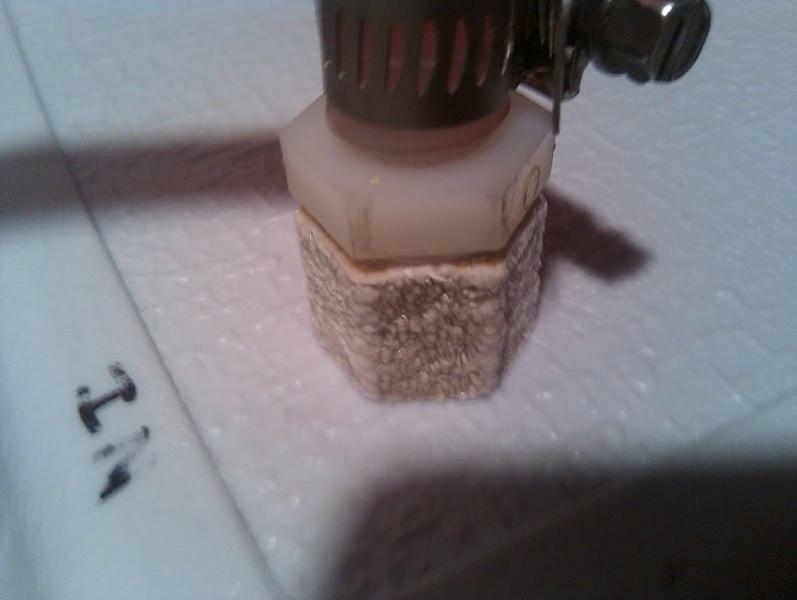 Keep in mind though the glycol was still chilled from the test. In fact, I had transferred it back to the jugs so I could do my plumbing and such, and after an hour, the jug was cold enough to form frost on the outside of it! After 35 minutes of running, the glycol was 20 degrees and the beer line was 43. At that point I started to manually cycle the dehumidifier on and off (so as to not freeze the beer), and ended up achieving 35 degree beer temp at the tap after about 50 minutes. Poured into a pint glass, a perfect 42 degrees! I call it R2-GlyCool! There's still some final touches to be done, such as adding a temperature controller, insulating the glycol lines before they enter the trunk line, and aesthetic refinements.